Fabuleux 1 chambre, 1 salle de bain condominium situé au coeur de Vail Village et directement sur la Gore Creek. Promenade facile aux pistes de ski, Bridge Street, restaurants et discothèques. Un espace de stationnement extérieur gratuit situé directement devant l'unité. La propriété dispose de nombreuses fonctionnalités, y compris Internet sans fil, 2 téléviseurs à écran plat, salle commune laveuse et sécheuse, une bibliothèque de films, un canapé-lit, 2 fauteuils inclinables, une cuisine bien équipée avec comptoirs en granit et lave-vaisselle. Un local à skis est situé à l'intérieur de la propriété. Les clients séjournant dans cet établissement bénéficient également d'un accès gratuit et illimité à l'Aria Club & Spa. L'Aria Club and Spa est situé à côté de l'hôtel Cascade, à la sortie de South Frontage Road. L’installation de plus de 78 000 pieds carrés est le plus important centre d’entraînement de Vail et un spa sans précédent pour son approche professionnelle de la condition physique et du bien-être personnel. Avec ses cours de fitness, son entraînement personnel, ses équipements de Pilates, de cardio et de musculation, une piste couverte, un terrain de basketball intérieur, des courts de tennis intérieurs, du racquetball, du squash, une piscine extérieure chauffée et des bains à remous, le Aria Spa & Club niveau. (Il y a un supplément pour les cours et le tennis). Vous bénéficierez également de 10% de réduction sur les soins au spa avant le 2 P. M.
Excellent location, easy walking distance to the lift. Nice and clean, no surprises in the condo. The condo was unclean, made plumbing related noises day and night. Smelled like it was smoked in. Very undesirable property. Smelly, dirty bathroom, missing cabinets, extremely noisy all hours of the night. I will never stay at this property ever again nor will I ever use Berkshire Hathaway ever again. Towels were old and looked really dirty, kitchen utensils were old, unclean, didn’t look sanitary. Really just a pathetic condo which would be more appropriate in a 3rd world country but no Vail. Thank you for taking the time to write a review. We are sorry to hear that you had a negative experience. We never want our guests to have a negative experience. We will be reaching out to you by phone to discuss. We stayed in this apartment for a week in Aden for a skiing trip. Overall, we enjoyed our vacation in this cozy apartment. 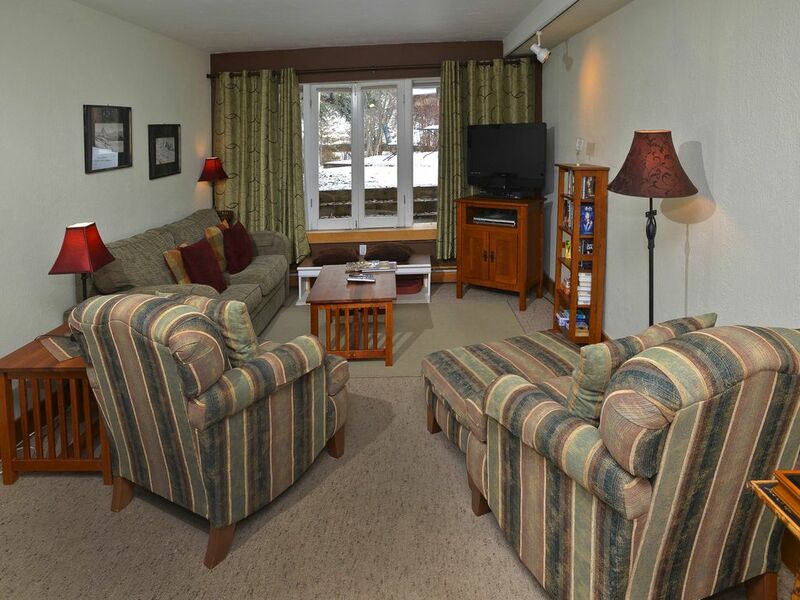 Positives: quiet, cozy, warm, well stocked kitchen, relatively modern decor, movie options with functional DVD, comfortable beds, close to Golden Peak lift and vail village. Some areas that could be improved: there is some clicking sounds from the pipes in evening although it did not disturb us much; we used the air mattress one night but it leaked most of its air in one evening; it’s a downstair unit which created a little challenge in handling luggage and food, but it’s manageable even for my 4-yr old girl. We will go back next time we go back to vail and will recommend this apartment to friends. I should have trusted my instinct. The price was too good to be true. Well it was about $125 a night less than what we are used to paying for comparable sized condos during dec / jan. in Vail village. They failed to disclose that there was major knocking and pinging in the pipes that will definitely keep you up all night! When I told them about it, they said that it was in the reviews! Well reviews aren't a substitute for disclosure. Had we been told, there is no way I would have booked this place. Also, just a few days in, the toilet overflowed leaving me to clean up the mess. In the managers defense, they did return my call about both issues promptly and they did bring me new towels the next day to replace the ones that I had to use to mop up the mess. There was a missing cabinet door in the kitchen that had a note on it saying the previous tenants had a mishap and they were fixing it. They never came to replace the door. One of the shower doors gets stuck so very inconvenient to get in and out of the shower. The airbed leaked so my 6 year old woke up on the floor every morning. The only true convenience about the unit was the fact that the laundry room was right in front so it was easy to do laundry. If you are looking for cheap and don't mind not getting a good nights rest then this is a good choice. Other than that, I would not recommend. Thank you for taking the time to write a review. We are sorry that this unit did not meet your expectations. Some guests have reported banging noise in the heating system of the building and others have not. It seems to be fairly random but unfortunately it is part of the common heating system that we can not control or remedy. We did try to respond to your maintenance requests as quickly as possible. Most guests find this unit very cozy and comfortable at a good value with a great location in the village and so we are disappointed that it didn't meet your expectations. I hope we can assist you in the future, even if it is in another property. It located very convenient place. We are able to walk to the amphitheater, Vail Village. Easy access from the freeway. The room has nearly everything we need and clean although it is an old building. TV does not have a signal (DVD works). Definitely, we will go back again!